The Edward River, shores lined with giant river red gums, winds through Deniliquin offering a relaxing and peaceful experience for visitors - or an exhilarating one for waterskiers in its dedicated ski zone! The river around Deni is divided into a ski zone and a no-ski zone, so whether you want a peaceful connection or a wild ride, the Edward River has it for you. Visitors can hire a houseboat or pontoon boat or relax in a canoe or tube and paddle or float through the forest teeming with birds and native wildlife. A canoe launch for wheelchair users will be available at Edward River Picnic Area from Spring 2018. 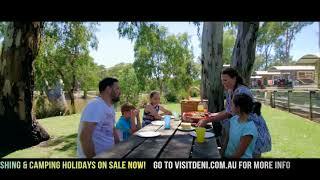 The river is famous for its fishing, particularly for Murray Cod and Yellowbelly. Combine this with riverside camping and cabins, and you're all set for a real break. It's easy to get onto the Edward River in Deni, with three public boat ramps with trailer parking. 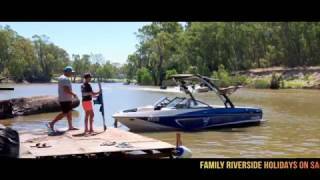 Waterskiers can join in Deni Boat Club's afternoon ski schools in a fun family atmosphere November to April.